International Women’s Day - Who is included? March 8th marks the United Nation’s International Women’s day, a global event celebrating the social, economic, cultural and political achievements of women. IWD seeks to recognise the accomplishments of women worldwide whilst also reflecting upon the pressing challenges experienced by women and girls from all walks of life. Despite recent advances, there remains a tremendous amount of work in addressing the social, cultural and economic rights of women in South Africa and other parts of the world. Women and girls in South Africa continue to fight against barriers to equality that threaten their economic and personal security and freedoms to live productive and meaningful lives of dignity. Often, when discussing women's rights internationally (as with IWD), rhetoric can default to the premise and assertion that all women share common concerns that affect them as a group regardless of their social or geographical position. Whilst this may be partially true, it assumes a shared reality for all women which unfortunately is not the reality, particularly in an unequal society such as South Africa's. The legacy of apartheid means this lack of shared experiences is particularly evident as socio-economic positioning (still overwhelmingly linked to race) continues to be the determining factor in women's ability to enjoy substantive equality. Furthemore, just as there is a tendency to neglect the intersectional obstacles to women based on their location or socio-economic status, so heteronormative ideas around “women’s issues” have long ignored the experiences of lesbian, bisexual and trans* women and excluded their concerns from the wider discourse. In order to begin to address equality for women, we must have a full understanding of the experiences of all women. Sexual violence and the fear of secondary victimisation are issues for all women but are often heightened for LBT women. LBT women, by sheer virtue of their identity, tend to lack family support structures, have a deep mistrust of the police, and are less likely to seek help when they have been victimized. 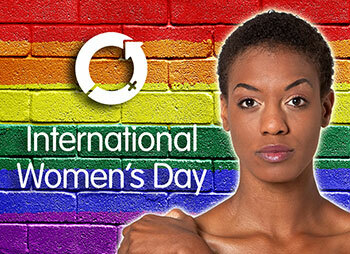 Initiatives like IWD must acknowledge that whilst all women have certain vulnerabilities that stem from their positions in a patriarchal and violent society, LBT women have additional vulnerabilities which arise from their being gender non-conforming or being a sexual minority in a heterosexist and conservative society. Triangle Project has been working with LGBTI people and LBT women for over 20 years in Cape Town and has always emphasized the importance of placing the struggle for LBT equality within the broader struggle for women’s equality. This International Women’s Day we ask the simple question: “Who is included?”. We call on government, civil society and other domestic and international actors to ensure that, whilst commemorating IWD today and in the work they do for women on every other day of the year, that they ask themselves if they really are including all women. Matthew Clayton is the Research, Advocacy & Policy Manager at Triangle Project, an LGBTI human rights NGO based in Cape Town.